As so often seems to be the case, one goes on vacation only to come home to a laundry list of things that has grown a lot longer since one went on vacation - at least that's been the case for me this week hence the reason no one has gotten to see any of those 1,400+ pictures from my recent trip to New Hampshire and Maine yet. I could bore you with all of the details of what I've been doing since I got home late Sunday night but that doesn't sound like a lot of fun so instead I'm going to post one of the pictures that I have actually managed to do something with since returning - kind of a sneak peek sort of thing! This is part of the Swift River as it runs through Conway Village in the White Mountains of New Hampshire. 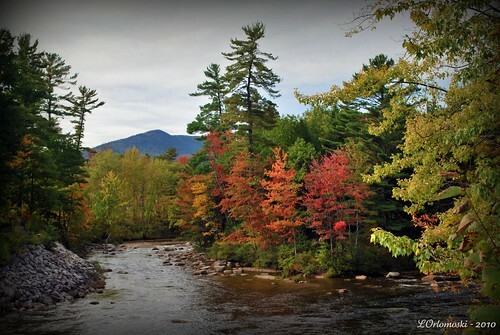 The Swift River is one of the major tributaries of the Saco, a 120-mile river which originates at Saco Lake in Crawford Notch and flows on to the Atlantic Ocean in Maine. I stopped to take pictures in this particular spot as there's a very nice covered bridge just out of view that if you promise to come back another day, I promise to show to you! Honest! wow, beautiful! I wish the leaves here were as beautiful there. Glad you had a great time too. Looking forward to seeing more! You are such a tease! I absolutely love this and cannot wait to see the covered bridge. Spectacular. That scene is breathtaking. I love the blaze of color... Love it! Love it! I had to check to see where you were visiting to take this shot as it looked a lot like a mountain stream here in my neck of the woods. (But I didn't recollect your saying you were going to be visiting Pennsylvania so it kind of floored me at first.) Beautiful scene and shot though Linda. Just gorgeous! 1400 photos and we just get the one? Well, at least it's a fabulous one! A mountain, a river and stand of trees in glorious color! It's my current desktop wallpaper... just saying. That's such a fabulous photo - it looks like a painting! That is a lovelt shot. I look forward to seeing more! Beautiful Linda. We too have been playing catch up from our trip to the bay. Maybe we'll be caught up after next week. Maybe. I bet you could sell that photograph for a postcard.